Despite heavy investments in mobile network expansion and wireline operations, service providers as a whole have delivered disappointing financial results over the past decade. More often than not, they have been outmaneuvered by cloud service providers (CSPs) in the competition for IT spending. Over-the-top (OTT) services have diverted a large percentage of service revenue to cloud data center operators, who successfully positioned the wide area network (WAN) as dumb pipes to reach their content and services. Traditionally, CSPs have focused their investments on deploying and maintaining capex- and opex-intensive WAN infrastructure. By operating at scale far larger than any individual network user, they were able to charge a premium for ubiquitous any-to-any connectivity. Cloud data centers now operate at a comparable scale and create innovative connectivity through cloud and social networking services that relegate the CSP to an access provider for data center WAN backhaul. This intensifying competition has forced CSPs to fuel a business based on cost-intensive infrastructure with tumbling average revenue per user (ARPU). Therefore, CSPs are searching for new revenue that leverages their ongoing infrastructure investments. This may require adopting a modified business model, but being able to amortize new businesses on a converged infrastructure that is hard to replicate will give them a competitive advantage. While the situation for beleaguered service providers might appear bleak, the Internet of Things (IoT) provides them a great opportunity to recapture their market value by adding value to their customers and our evolving society. The number of connected devices is expected by leading vendors like Ericsson and Cisco to grow 50 fold by 2020 to 50 billion. According to Gartner, by 2020, the IoT will create $1.9 trillion of economic value, spanning both the B2C and B2B markets with verticals including smart cities, smart grids, smart homes, smart cars and wearable appliances. In addition to being an explosive growth market, the IoT leverages several CSP strategic strengths. First, it relies on ubiquitous connectivity across wide geographic areas, taking advantage of existing CSP network footprints. Second, IoT services require billing, accountability and security on a massive scale for all core competencies of CSPs. Lastly, the CSPs have extensive networks of channel and technology partners that can help them meet this large challenge with innovation. In fact, the IoT ecosystem is still in an early, highly malleable stage. This provides CSPs with an opportunity to take a leadership position as customers are looking for many new solutions. In order to capture a major share of this nearly $2 trillion emerging economic segment, service providers must develop a long-term perspective of their value. Service providers should look at the IoT as an opportunity to re-evaluate their business strategy. Like any good strategy, it needs not only to be executable, but also to factor in unique CSPs’ competencies, constraints and competition. Service providers must identify their role in the IoT value chain and be open to adopting new business models. 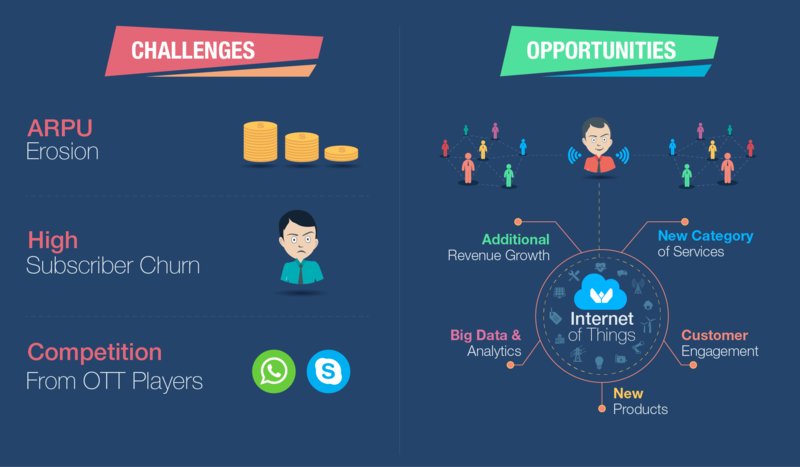 The IoT market is extremely diverse and will likely remain quite fragmented in the short term. By adopting a near-term vertical focus strategy, CSPs can deliver complete solutions and learn the IoT ropes without diluting their resources across a wide front. Nevertheless, they should keep in mind the necessity for scale and convergence. They must architect their solutions to span multiple verticals, perhaps including both B2B and B2C for large providers. Complete solutions may require some CSPs to broaden their business capabilities, particularly around bundling data processing services along with connectivity. The strategy must also include an appropriate and profitable pricing model for each vertical. For instance, pay-as-you-go pricing with separate roaming rates might fit the connected car market while healthcare services might require a subscription model. Digital signage service might command a premium for peak-hour, low-latency bandwidth and discount off-peak bulk updates. Each strategy must address device, service and data security, which have already emerged as critical concerns for IoT customers and an opportunity for provider differentiation. For example, high-value assets such as diesel generators, windmills and ATM machines require strong physical security, perhaps enabling the provider to bundle surveillance with device telemetry. Many providers will find B2B verticals appealing as market entry points. Governments across the globe are stimulating these verticals with smart city mandates and earmarked funding. For example, the United Kingdom already spends nearly $50 million dollars on the IoT and India’s central government has announced it will grant $1.6 million for each of up to one hundred smart cities. The demand for smart utilities and buildings is expected to take off from their current revenues of $240 billion and $50 billion, respectively. To complement their existing geographic coverage, CSPs have other core competencies that add value to a total IoT solution. They have sophisticated, highly scalable billing and customer support systems to help deliver a quality customer experience. CSPs also routinely deploy remote asset monitoring and reporting to network operators and customers. By reusing this capability, CSPs can help smart infrastructure owners specify and track key performance indicators (KPIs) and key quality indicators (KQIs) to optimize asset performance and maintenance costs. As these applications proliferate, demand for innovation will grow. A simple, subscription-based pricing strategy might be sufficient for smart infrastructure IoT. However, in these applications, high availability and security are critical, giving the providers the strategic advantages of their operational expertise and trusted reputations as reliable infrastructure suppliers. As mentioned above, the high device value of smart infrastructure creates opportunities to bundle additional security monitoring features such as physical access control and surveillance. Once they decide on a strategy, CSPs face many technical and business challenges to build IoT operations around their existing networks. End-to-end solutions will require seamless IoT device integration with the cloud. A scalable security solution must be architected, including real-time traffic flow auditing. The market is fragmented. As yet, there are very few standards that enable an open ecosystem. CSPs will need IoT platform and solution partners to accelerate execution, drive innovation and promote convergence across their ultimate market scope. On the marketing side, CSPs must both establish their brand and build a strong partnership network within their targeted ecosystem. This might include B2B infrastructure owners, car manufacturers or consumer appliance OEMs. To do so, they must clearly articulate their vision of their role in the value chain. With well-defined strategies and execution leadership, CSPs have an opportunity for financial metric redemption in the IoT, projected to be the next wave of data services. Their strategic assets are substantial, but the market needs leaders now.